President Obama will accept the Democratic presidential nomination at the Bank of America Stadium in Charlotte, North Carolina, a campaign official confirms to CBS News chief White House correspondent Norah O'Donnell. Mr. Obama will accept the nomination and deliver his convention speech on September 6, the final day of the Democratic National Convention. The open-air stadium, home to the Carolina Panthers, seats more than 73,000. The rest of the convention will take place at the Time Warner Cable Arena. 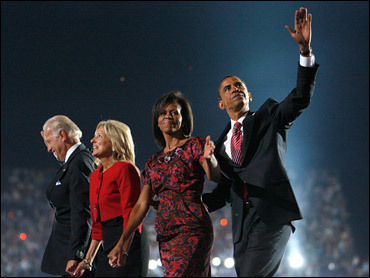 The president similarly accepted the 2008 Democratic presidential nomination at Invesco Field in Denver, in front of a crowd of about 75,000 people. Holding the event at the stadium could help excite voters in North Carolina, a key swing state in the presidential election. It also gives the Democratic National Committee the opportunity to sell sky box seats to high-ticket donors. However, holding the event in a stadium named after Bank of America could create bad optics, after a year in which voters took to the streets to protest big banks and Bank of America drew the ire of consumers with a $5 debit card fee. Update: DNC Chair Debbie Wasserman Schultz also announced today that the convention will be shortened from four to three days. The Monday of convention week, Labor Day, will be designated as a day "to celebrate the Carolinas, Virginia and the South at Charlotte Motor Speedway," according to a DNC press release. "We want this convention to be about more than just the pageantry and speeches you see on television. This is about engaging Americans in a meaningful way," Wasserman Schultz said.